A long rambling Tudor mansion designed for the 2nd Marquess of Donegall on the then outskirts of Belfast, who was in exile from his creditors in England. Originally a cottage style house, Morrison produced designs to increase it in size in various stages. After the death of the Marquess, his son auctioned off the contents to pay his fathers debts (which were considerable) in 1857 and the house was demolished in 1869. The grounds are now part of a park. 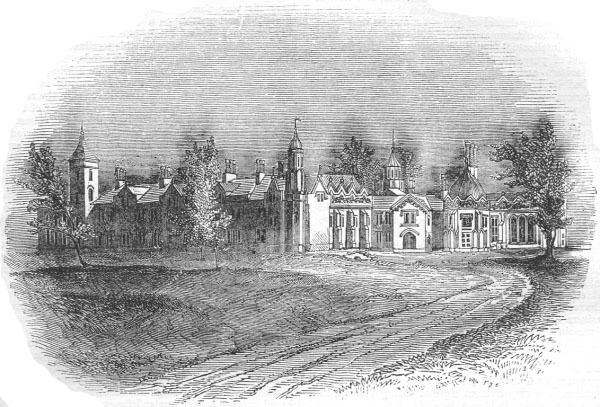 A description in The Illustrated Dublin Journal, Volume 1, Number 16, December 21, 1861: ORMEAU, the seat of the Marquis of Donegal, is situated on the east side of the river Lagan, about a mile south of Belfast. The mansion, which is an extensive pile of buildings in the Tudor style of architecture, was originally built as a cottage resi-dence in the last century, and has since gradually approximated to its present extent and importance. The original residence of the family was situated in the town of Belfast, and was a very magnificent castellated house, erected in the reign of James I. Of this noble mansion there are no vestiges now remaining. It was burnt in the year 1708, by an accidental fire, caused by the carelessness of a female servant, on which occasion three daughters of Arthur, the third Earl of Donegal, perished in the flames. A portion of the building, which escaped destruction, was afterwards occupied for some years, the family finally removing to their present residence, its preservation being no longer necessary. The demesne surrounding Ormeau is not of great extent, but the grounds are naturally of considerable pastoral beauty, commanding the most charming views of Belfast Lough and adjacent mountains, and have received all the improvements that could be effected by art. As has been observed, there are many finer places to be seen in Ireland, belonging to noblemen, but there are, unfortunately, few of them in which the presence of their lordly owners is so permanently to be found, attracting the respectful attachment of the various classes of society.